Configure static routing on labnario_1 and labnario_3 to PC_2 and PC_1 respectively, with GRE tunnel as outbound interface. This ensures that all traffic directed to those PCs will be going through GRE tunnel interface. Jan 28 2013 12:25:04.340.3-08:00 labnario_1 TUNNEL/7/debug:GRE_FWD: Tunnel0/0/0-Out:GRE/IP encapsulated 150.0.0.1->160.0.0.1(len = 84). Jan 28 2013 12:25:04.340.4-08:00 labnario_1 TUNNEL/7/debug:GRE_FWD: GRE Transmit: Transmit packets through IP output sucessfully. Jan 28 2013 12:25:04.400.1-08:00 labnario_1 TUNNEL/7/debug:GRE_FWD:GRE-Input: Src(160.0.0.1)/dest(150.0.0.1), length = 84. Jan 28 2013 12:25:04.400.2-08:00 labnario_1 TUNNEL/7/debug:GRE_FWD: Get packet without checksum. Jan 28 2013 12:25:04.400.3-08:00 labnario_1 TUNNEL/7/debug:GRE_FWD: Tunnel0/0/0-In: GRE decapsulated IP source(172.16.10.1)/destination(172.16.0.1)(len = 60). 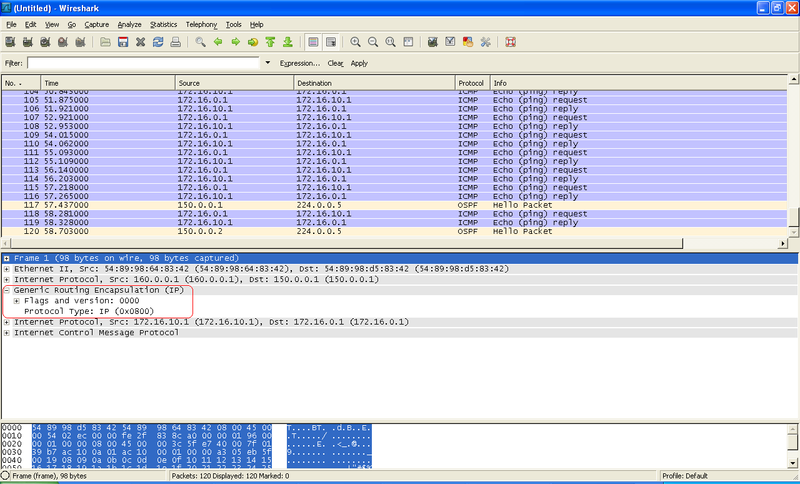 Jan 28 2013 12:25:04.400.4-08:00 labnario_1 TUNNEL/7/debug:GRE_FWD: Put packets into IP queue sucessfully. Jan 28 2013 12:25:05.400.1-08:00 labnario_1 TUNNEL/7/debug:GRE_FWD: GRE-Encapsulation: Mbuf length = 60 from Tunnel0/0/0 out.